A darkly imaginative and yes, a diabolic setting, with a ferociously loyal heroine. Will I continue this series? This is a stand alone, and that is so freaking awesome. I will definitely read more from this Author. Update (2/24/17) this is now a trilogy and I'm super happy about that because it was such a good book. First off, the futuristic tech in this is mind-boggling and I wouldn’t mind some of those bots for myself. The reviews are all over the place for this one. I was shocked to find out how much some people hated this…I don’t get it. I thought it was perfect, especially the ending. I don’t know…I’m confused maybe some just like a tragic ending rather than a happy one, at least happy-ish. I guess it just goes to show what makes one person happy, isn’t what makes another so. 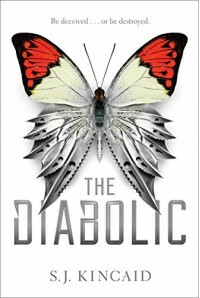 The Diabolic is a complex story told all in one book and it’s not even overly long. That alone is something to love about this book. It also has lots of action and plenty of intrigue and a little romance to boot. All in all, it totally gets my recommendation.